Review: I can’t say often enough how much I enjoy friendship stories. That being said, Chasing Shadows was a completely different creature than I am used to. Reading Holly and Savitri’s story of friendship, loss and grief was definitely a different experience. Holly and Corey are twins; Savitri and Corey are dating. The three are a close trio of friends who face risk headlong by freerunning all over the city, off high buildings and through alleyways. When Corey is killed, Holly and Savitri’s friendship is put to the test as Holly seeks closure and vengeance, while Savitri tries to decide her future college path. Both grieve in their own ways, as shown by the two unique perspectives in Chasing Shadows. Both girls’ grief is affected by more than Corey’s death. Holly’s grief begins to spiral into insanity as her reality begins to blend with the Leopardess comics she loves to read. Savitri’s grief and outlook on life is influenced by her cultural background and the story behind the name Savitri. The blending of influences is illustrated through comic pages interspersed throughout the narrative. While this approach to storytelling felt fresh and different, it also felt at odds with the flow of the story. That, combined with the stylized writing meant to depict Holly’s gradual breakdown, made immersion in the story difficult. 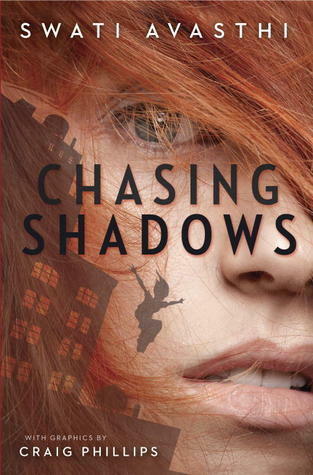 Chasing Shadow‘s innovative approach to storytelling is its main draw and also, at times, its weakness. This is a great book for anyone who enjoys psychological stories, or just wants to read about freerunning.